From left to right, Cody Riley, LiAngelo Ball, and Jalen Hill all under fire for shoplifting. 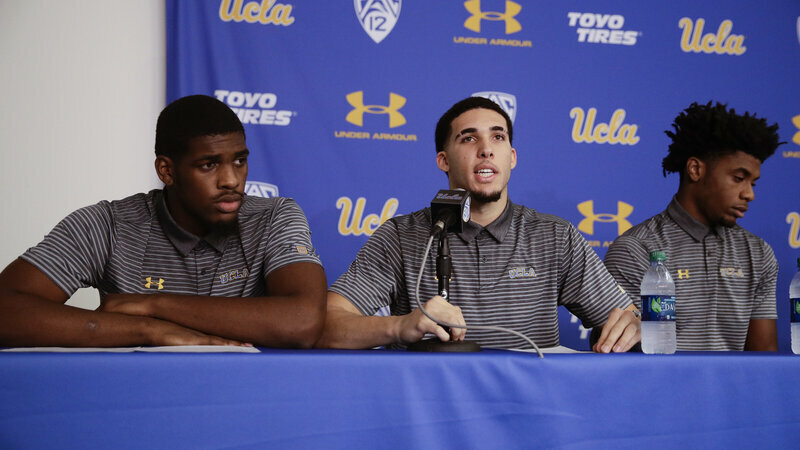 Three UCLA freshmen were suspended indefinitely from their basketball team a day after returning from China, where they were detained and accused of shoplifting. UCLA basketball coach Steve Alford said “They’re going to have to regain the trust of this athletic department, of this university, and because this was such a high-profile international matter, the trust of the general public,” during a news conference. Alford later explained that the school is currently reviewing the issue with its office of student conduct. The three players—LiAngelo Ball, Jalen Hill, and Cody Riley—also spoke at the news conference and apologized and admitted to stealing. They were supposed to play Georgia Tech at the Pac-12 China Game on Nov. 10, but were detained on Nov. 7, spending one night at a police station and remaining at a Hangzhou hotel for nearly a week. Earlier that day, President Trump tweeted, “Do you think the three UCLA Basketball Players will say thank you President Trump? They were headed for 10 years in jail!” Each player proceeded to thank the president for his generosity. Later that day, the players were sent back home to Los Angeles. White House chief of staff John Kelly called the three players over the weekend, according to UCLA Athletic Director Dan Guerrero, who also spoke at the news conference.